What Kind of War Do You Want to Fight? A-10. U.S. Air Force photo by Master Sgt. Blake R. Borsic. Kind of. While there certainly are other USAF platforms capable of the CAS mission, none do it as effectively as the venerable A-10. The B-1s and B-52 heavy bombers Gen. Schwartz suggests can fill the A-10s role have proven themselves in the close air support role, though it strains logic to suggest that these strategic platforms are a particularly cost effective way to do tactical air strikes in an uncontested battlespace. Similarly, multirole aircraft like F-16s and F-15Es are effective CAS platforms, but have struggled to match the A-10’s versatility in the role: in the late 1980s the USAF brass, enamored with multirole fighters able to perform to more than one mission, attempted to replace the A-10 in the CAS role with the more flexible F-16. However, the A-10’s dramatic success in the Gulf War reinforced the value of a dedicated, heavily armored CAS platform, and the Warthog stuck around. While the mission the A-10 was designed for — plinking Soviet tanks at close range over foggy European battlefields — never materialized, its unique status as a designed-from-the-ground-up mudfighter makes it difficult to imagine any other aircraft perfectly replacing the Warthog. But there’s more to A-10 cuts than the Air Force’s historical indifference to the unglamorous CAS mission. In the context of the US armed forces’ realignment towards the Pacific, downsizing the A-10 fleet makes sense. Everyone in Washington’s insisting that the US is done fighting small wars, and that the military’s future priority is countering near-peer rivals in conventional conflicts (read: China). In a contested operating environment the A-10’s survivability isn’t assured: while its armor and partially obscured exhaust allow it to perform well against small arms fire and MANPADS, non-stealthy aircraft are unlikely to survive long in a conflict against a technologically advanced foe like China. The upcoming F-35’s lack of armor and shorter loiter capability make it an inferior CAS platform, but widely proliferating advanced SAM systems and the modernizing PLAAF make it and other stealth aircraft the only option in a future near-peer conflict. But the United States has a habit of stumbling into small wars — after all, less than three decades separate the twin COIN quagmires of Vietnam and Iraq. For all of the Pentagon’s insistence that counterinsurgency is dead, history makes it hard to believe that US policymakers will refrain from foreign interventions in the future. 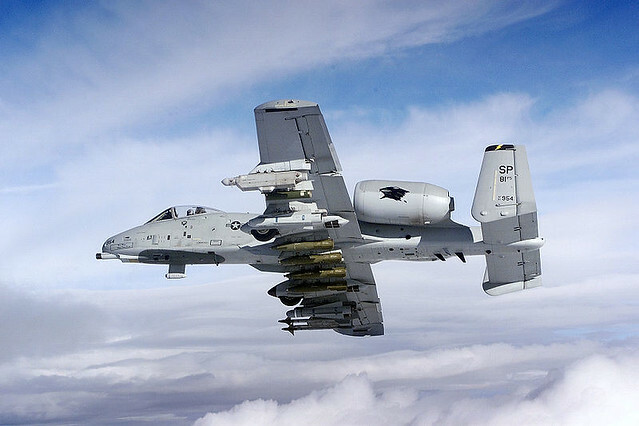 If the Pentagon eliminates rugged, low cost weapons like the A-10 in favor of costly new weapons systems optimized towards major wars it could come to regret it. Many of the US’s greatest missteps in Iraq and Afghanistan grew out of the Pentagon and Bush administration’s pathological reluctance to acknowledge they were embroiled in exactly the type of counterinsurgency a Vietnam-fatigued US military leadership had sworn never to repeat. Preparing for the unlikely conventional wars the military wants is a recipe for being unprepared to fight the dirty and unglamorous conflicts policymakers are in the habit of giving it. Update: Michael Hoffman makes a similar point at DoD Buzz.